Combinatorial geometry: Polygons, polytopes, triangulations, planar and spatial subdivisions. 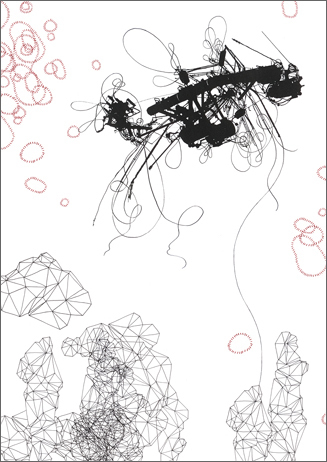 Constructions: triangulations of polygons, convex hulls, intersections of halfspaces, Voronoi diagrams, Delaunay triangulations, arrangements of lines and hyperplanes, Minkowski sums; relationships among them. Geometric duality and polarity. Numerical predicates and constructors. Upper Bound Theorem, Zone Theorem. Algorithms and analyses: Sweep algorithms, incremental construction, divide-and-conquer algorithms, randomized algorithms, backward analysis, geometric robustness. Construction of triangulations, convex hulls, halfspace intersections, Voronoi diagrams, Delaunay triangulations, arrangements, and Minkowski sums. Geometric data structures: Doubly-connected edge lists, quad-edges, face lattices, trapezoidal maps, conflict graphs, history DAGs, spatial search trees (a.k.a. range search), binary space partitions, quadtrees and octrees, visibility graphs. Applications: Line segment intersection and overlay of subdivisions for cartography and solid modeling. Triangulation for graphics, interpolation, and terrain modeling. Nearest neighbor search, small-dimensional linear programming, database queries, point location queries, windowing queries, discrepancy and sampling in ray tracing, robot motion planning. Here are Homework 1, Homework 2, Homework 3, Homework 4, and Homework 5. David Eppstein's Geometry in Action and Geometry Junkyard. Jeff Erickson's Computational Geometry Pages. Lists of open problems in computational geometry from Erik Demaine et al., Jeff Erickson, and David Eppstein. My robust predicates page (floating-point inputs, C). Chee Yap's CORE Library (C/C++). David Bailey's extensive MPFUN arbitrary precision arithmetic package (floating-point, C++ or Fortran). Olivier Devillers' predicates (integer inputs). Stefan Näher et al. 's LEDA contains several arbitrary precision numerical types, including integers and floating-point (C++). Commercial; you have to pay for it. 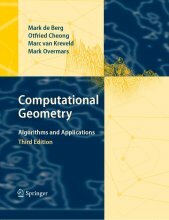 Mark de Berg, Otfried Cheong, Marc van Kreveld, and Mark Overmars, Computational Geometry: Algorithms and Applications, third edition, Springer-Verlag, 2008. ISBN # 978-3-540-77973-5. Or, second revised edition, Springer-Verlag, 2000. ISBN # 3-540-65620-0. Known throughout the community as the Dutch Book. 1: August 26 Two-dimensional convex hulls Chapter 1, Erickson notes . 2: August 31 Line segment intersection Sections 2, 2.1 . 3: September 2 Overlay of planar subdivisions Sections 2.2, 2.3, 2.5 . September 7 Labor Day . .
4: September 9 Polygon triangulation Sections 3.2–3.4 . 5: September 14 Delaunay triangulations Sections 9–9.2 . 6: September 16 Delaunay triangulations Sections 9.3, 9.4, 9.6 . 7: September 21 Voronoi diagrams Sections 7, 7.1, 7.5 . 9: September 28 Duality; line arrangements Sections 8.2, 8.3 . 10: September 30 Zone theorem; discrepancy Sections 8.1, 8.4 . 11: October 5 Polytopes Matoušek Chapter 5 . 13: October 12 Small-dimensional linear programming Seidel T.R. ; Sections 4.3, 4.6 . 14: October 14 Small-dimensional linear programming Section 4.4; Seidel appendix . 15: October 19 Higher-dimensional convex hulls Seidel T.R. ; Secs. 11.2 and 11.3 . 16: October 21 Higher-dimensional Voronoi; point in polygon Secs. 11.4, 11.5 . 17: October 26 k-d trees Sections 5–5.2 . 19: November 2 Interval trees; closest pair in point set Sections 10–10.1; Smid Sec. 2.4.3 . 20: November 4 Segment trees Section 10.3 . 21: November 9 Geometric robustness Lecture notes . November 11 Veterans Day . .
23: November 18 Binary space partitions Sections 12.5, 2.4, BSP FAQ . 24: November 23 Robot motion planning Sections 13–13.2 . 26: November 30 Visibility graphs Chapter 15; Khuller notes . For August 26, here are Jeff Erickson's lecture notes on two-dimensional convex hulls. For October 5 and 7, if you want to supplement my lectures, most of the material comes from Chapter 5 of Jirí Matoušek, Lectures on Discrete Geometry, Springer (New York), 2002, ISBN # 0387953744. He has several chapters online; unfortunately Chapter 5 isn't one of them. For October 7, I will hand out Raimund Seidel, The Upper Bound Theorem for Polytopes: An Easy Proof of Its Asymptotic Version, Computational Geometry: Theory and Applications 5:115–116, 1985. Don't skip the abstract: the main theorem and its proof are both given in their entirety in the abstract, and are not reprised in the body at all. Seidel's linear programming algorithm (October 12 & 14), the Clarkson–Shor convex hull construction algorithm (October 19), and Chew's linear-time algorithm for Delaunay triangulation of convex polygons are surveyed in Raimund Seidel, Backwards Analysis of Randomized Geometric Algorithms, Technical Report TR-92-014, International Computer Science Institute, University of California at Berkeley, February 1992. Warning: online paper is missing the figures. I'll hand out a version with figures in class. For October 14, I will hand out the appendix from Raimund Seidel, Small-Dimensional Linear Programming and Convex Hulls Made Easy, Discrete & Computational Geometry 6(5):423–434, 1991. For anyone who wants to implement the linear programming algorithm, I think this appendix is a better guide than the Dutch Book. On November 2, I will teach a randomized closest pair algorithm from Section 2.4.3 of Michiel Smid, Closest-Point Problems in Computational Geometry, Chapter 20, Handbook on Computational Geometry, J. R. Sack and J. Urrutia (editors), Elsevier, pp. 877–935, 2000. Note that this is a long paper, and you only need pages 12–13. For November 9, here are my Lecture Notes on Geometric Robustness. For November 18, here is the BSP FAQ. For November 30, here are Samir Khuller's notes on visibility graphs. These applets can be quite helpful in establishing your geometric intuition for several basic geometric structures and concepts. CS 170 (Advanced Algorithms) or the equivalent. In particular, you should know and understand amortized analysis; how to solve recurrences; sorting algorithms; graph algorithms like Dijkstra's shortest path algorithm, connected components, and topological sorting; and basic data structures like binary heaps, hash tables, and balanced binary search trees (splay trees or AVL trees or red-black trees or 2-3-4 trees or B-trees). Every one of these will make an appearance at least once. A basic course in probability. Experience doing mathematical proofs. 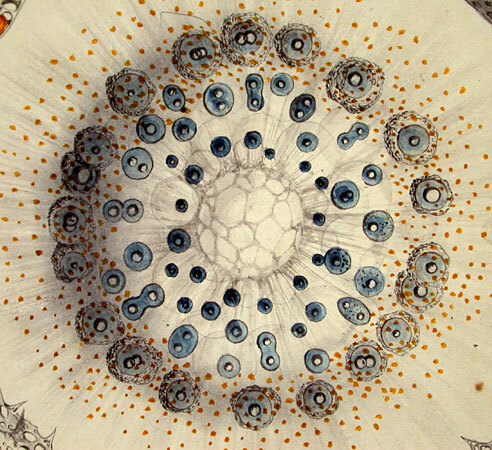 If you've never taken a class where you did lots of proofs, consider working your way through Bruce Ikenaga's notes and Larry Cusick's notes and exercises. 20% for the project: a Delaunay triangulation implementation, or an alternative by arrangement with the instructor. Supported in part by the National Science Foundation under Awards ACI-9875170, CMS-9980063, CCR-0204377, CCF-0430065, CCF-0635381, IIS-0915462, and EIA-9802069, in part by a gift from the Okawa Foundation, and in part by an Alfred P. Sloan Research Fellowship.